Our Popcorn ELT Primary Readers are a series of low-level, graded readers. Based on popular films, TV series and classic children’s literature, Popcorn ELT Primary Readers are targeted at children in the early stages of learning English. They are published at four levels following a carefully graded syllabus. This month, the spotlight is on Smurfs: The Lost Village, a Level 3 ELT Reader based on the latest film in the much-loved Smurfs series. Level 3 Readers are for students who are reading confidently in English, based on a 300 headword list. Basic knowledge of the simple past tense is built upon at this level. Many years ago, Gargamel the evil wizard made Smurfette out of clay. He sent her to Smurf Village to catch the Smurfs. But Papa Smurf saw the good in Smurfette and she became friends with all the Smurfs. However, she didn’t always feel like a ‘real’ Smurf. Now that Smurfette and her friends are in danger, it’s time for her to prove to herself that she is a real Smurf after all. “Students who have seen the film know that the CGI is great and one of the things I enjoyed most was having such wonderful film stills to work from, lots of which appear in the reader. This story introduces some awesome new Smurfs – read the story to find out who they are! As the author of the Smurfs ELT Reader mentions, every Reader also includes a factfile on real-world aspects of the story – in the Smurfs Reader, the focus is on dragonflies. 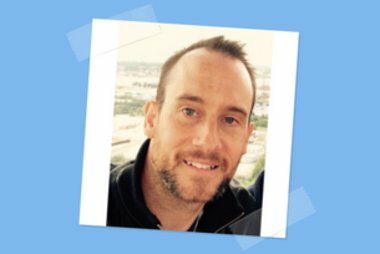 This non-fiction section is a great way to vary the reading experience and helps to introduce useful new vocabulary on a cross-curricular topic. 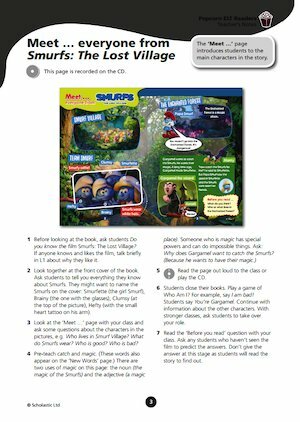 The free teacher’s notes for Smurfs: The Lost Village are the perfect lesson planning aid. From chapter quizzes to flashcards, there are plenty of extra resources included, as well as a worksheet, reading prompts and activity ideas. The Book Only version of Smurfs: The Lost Village can be purchased here. The Book & CD version can be purchased here. 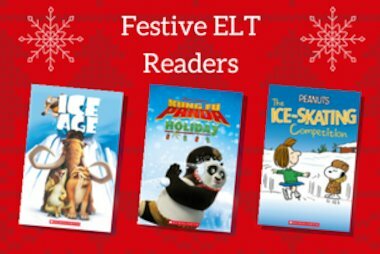 For more information about our ELT Readers, take a look at our ELT homepage.